The first cookbook from innovative and highly regarded chef Chris Cosentino, this contemporary collection of mouthwatering Italian antipasti recipes, written for the home cook, is unlike anything on the market. The seasonal and innovative ingredient combinations found in each of the Italian dishes in Beginnings exemplify Chris’s style of cooking made popular at his highly regarded restaurant Incanto and make use of his love of Italian salumi from his popular salumeria Boccalone. The recipes are at once simple and rustic, yet contemporary and inspiring. 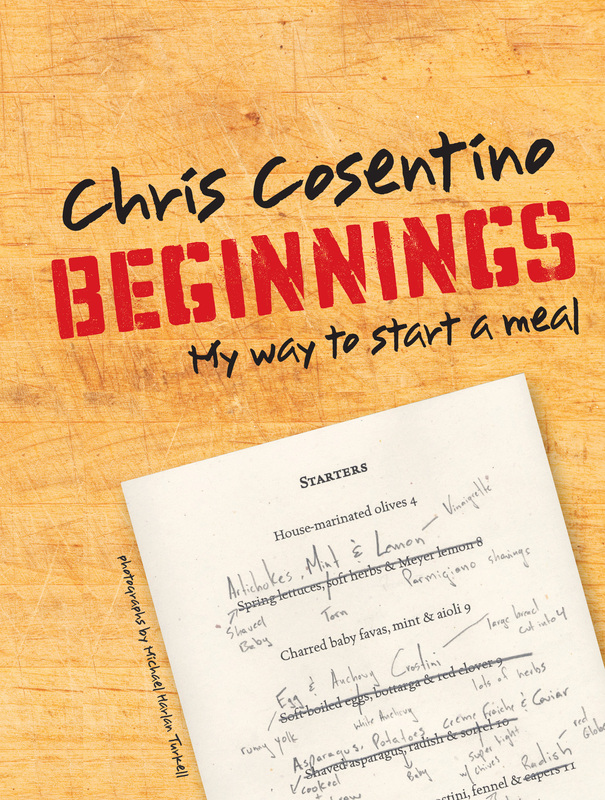 The first cookbook from innovative and highly regarded chef Chris Cosentino, Beginnings presents more than 60 recipes for Italian-style first courses. Organized by season, the book draws upon Chris’s years of experience cooking both at home and in restaurant kitchens. The seasonal, yet creative ingredient combinations found in each of the dishes exemplify the style of cooking Chris employs at his San Francisco restaurant, Incanto, and many of them make use of his love of Italian salumi from his artisan salumeria, Boccalone. Hand-rendered sketches of many of the dishes and personal stories throughout, combined with the simple and rustic, yet contemporary and inspiring recipes give you a rare glimpse into one of today’s most exciting culinary minds. "Though long a fearless pioneer and innovator on the San Francisco Bay Area scene, Chris Cosentino's excellent book offers comfort, reassurance and an array of enticing possibilities. If you thought you had enough "Italian" cookbooks? You clearly don't." "Chris cooks with a lot of heart. And you see that in his restaurant, in his cured meats, and in this cookbook. He takes care with each and every ingredient and shows you how to make them astonishing." "When I met Chris, he was known as a chef with a peerless reputation for cooking offal and variety meats. Over the years of our friendship, I have come to love and admire him as a brilliant and creative technician, one of the best chefs in the country, a culinary daredevil without boundaries. That being said, the best thing he ever made me to eat was a humble bowl of noodles that remain the benchmark against which I measure all pasta courses. I am thrilled that Chris has put all of that genius into a book that is as satisfying for the food geek as it is for a family to pull weeknight dinners from. It's a stunning debut of workable recipe authorship from a thinking man's chef." "Chris built his reputation on cooking hearts, brains, and kidneys, but it's the soul in his food that sets him apart from his peers."